From January’s birdlife, which goes on the back burner during the bitter winter cold to the melancholy autumn months when the migrating birds leave us for more southerly latitudes. Each season has its particular birds, and this richly illustrated book concentrates on the bird’s annual cycle. Here you can note down everything -day-to-day events that should not be forgotten, or hearing he first blackbird of the year. In addition, each week a bird species is presented with an attractive bird motif painted by Dan Zetterström, one of the finest bird illustrators in the world. This is the ideal diary for anyone interested in nature, but also for people fascinated by birds. There are also weather symbols which make it easy to record each day’s weather and temperatures. 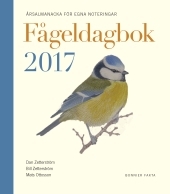 The text is written by Mats Ottosson, a journalist with a particular interest in birds and nature.